If you and a group of mates want to get togther and buy a bulk load of Titleist golf balls we have the stock for you. This will be a random mix of all Titleist ball types except Titleist Pro V1 and V1x. Models include the latest ball models such as Velocity, DT SoLo, NXT Tour and more. 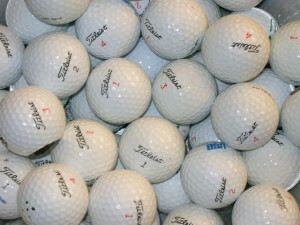 A Great Way To Buy Cheap Titleist Golf Balls If you and a group of mates want to get togther and buy a bulk load of Titleist golf balls we have the stock for you. This will be a random mix of all Titleist ball types except Titleist Pro V1 and V1x. Models include the latest ball models such as Velocity, DT SoLo, NXT Tour and more.